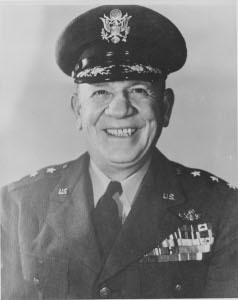 The Pacific War Online Encyclopedia: Whitehead, Ennis C.
Ennis "the Menace" Whitehead attended the University of Kansas before being commissioned as an Army aviator and deployed to France during the First World War as an instructor and test pilot. He was briefly discharged to complete his degree at the University of Kansas before returning to active duty. Ennis served as Kenney's deputy at 5 Air Force, where he proved to be a meticulous planner. He assumed command of 5 Air Force following Kenney's promotion to command of all Allied air forces in the Pacific. Receives a regular commission. Assigned to 55 Regiment.